Tiktaalik—sticking its head out of water? Once again, Tiktaalik roseae has come into the spotlight. More of the cranium has been unearthed, allowing for a fresh examination of Tiktaalik’s head.1,2 This has been touted as further evidence that Tiktaalik is the prime ‘missing link’ fossil between fish and land animals. Many features needed for terrestrial existence are simply not present in Tiktaalik. Because of this, the most important changes in the braincase are pushed to another link that is truly missing. Moreover, it could not have been preparing for the transition to land because evolution is blind; it cannot foresee what will evolve in the future—especially when the raw material for evolutionary change is supposed to come from random mutations. Many features needed for terrestrial existence are simply not present in Tiktaalik. Because of this, the most important changes in the braincase are pushed to another link that is truly missing. What Tiktaalik represents is a mixture of traits that together make a viable creature. Many of the traits of its head are still clearly fish-like, some are unique, such as the hyomandibula,5 and some are tetrapod-like. What this represents is a mosaic of traits (See Tiktaalik—a fishy missing link), which in an evolutionary framework are all at different stages of evolution. However, natural selection can only work on organisms; therefore a new trait cannot be selected for outside of the context of the whole organism. Moreover, mosaic evolution does not identify an evolutionary lineage; they have only identified traits that seem to change in complex, independent and contradictory ways in an evolutionary framework. Once again, the tempest of Tiktaalik is reduced to a teacup. The cranial features of Tiktaalik identify it as fundamentally a fish, though some of its unique features may mean that it was able to breathe air, like the lungfish. So the answer to the question posed in the title is a tentative yes, but in a completely non-evolutionary sense. Tiktaalik represents a mosaic form that was fully functional, and hence evolution is not required to explain this creature’s origin. Dunham, W., ‘Walking fish’ reveals fresh evolutionary insights, Reuters UK, October 15 2008. Return to text. Milius, S., How Tiktaalik got its neck, Science News, 15 October 2008. Return to text. A plesiomorphy,in evolutionary taxonomy, is a trait that common to members of a particular group, but not unique to that group. E.g. the spinal column is common to hummingbirds, humans and hyraxes, but according to evolution it arose in a much earlier common ancestor, so can’t shed light on evolutionary origins of these separate groups. Return to text. Downs, J.P., Daeschler, E.B., Jenkins Jr, F.A. 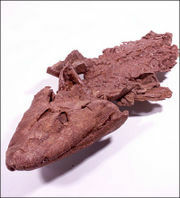 and Shubin, N.H., The cranial endoskeleton of Tiktaalik roseae, Nature 455:925–929, 2008. Return to text. The hyomandibula is a pair of deep bones or cartilage in the hyoid (neck) region in most fishes, which usually helps suspend the jaws. Return to text. Daeschler, E.B., Shubin, N.H. and Jenkins Jr, F.A., A Devonian tetrapod-like fish and the evolution of the tetrapod body plan, Nature 440:757–763, 2006; p. 762. Return to text.